Difference between revisions of "Surya"
Surya is a cosmic being from Sirius. He wields the tremendous power of the God Star on behalf of the evolutions of earth. His flame is an intense blue tinged with white. During the medieval period in India, worshipers of Surya formed one of the five principal sects. Worship of Surya ranked with the worship of Shiva, Shakti, Vishnu and Ganesha. The importance of the Sun God Surya is evident in Vedic hymns and Hindu mythology. The Gayatri hymn from the Rig-Veda identifies Surya with the Hindu Trinity. The hymn is addressed to the sun and associates Brahma with the sun in the morning, Shiva with the sun at midday, and Vishnu with the sun in the evening. The worship of Surya is mentioned repeatedly in the Ramayana, the oldest epic in Sanskrit literature. After offering a prayer to Surya, Rama overcomes his enemy with ease. Surya is traditionally depicted seated on a lotus in a chariot of gold drawn by seven horses or by a single horse with seven heads. He crosses the sky observing the good and bad deeds of both mortals and immortals. Surya’s chariot is usually depicted with only one wheel. The one wheel is seen as symbolic of the straight path of justice he maintains. The charioteer is the deity of the dawn, who rides in front of Surya, using his body to shelter the world from Surya’s brilliant rays. One Hindu myth relates that the sun-god Surya married the daughter of the celestial architect of the gods. She found Surya’s radiance too strong to bear and ran away. Surya pursued his wife and after a long search found her. Once they were reunited, the architect of the gods refashioned Surya so that his wife would be able to remain with him. While singing praises to the sun god, the architect cut away his excessive radiance, keeping intact just a fraction of his original glory in spherical shape. Out of the excess radiance, he created weapons for various gods, including Shiva’s trident. Surya remained resplendent in spite of his alteration. He and his wife had many sons. The eldest was Vaivasvata Manu, who in Hindu tradition is the progenitor of the human race. We know Vaivasvata Manu as the manu of the fifth root race. 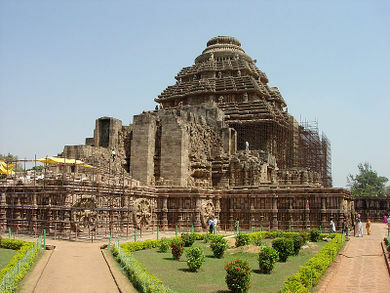 One of the most famous temples dedicated to Surya is the colossal thirteenth-century Surya Deula (Sun Temple) at Konark in the state of Orissa, India. This one-hundred-foot-high temple and its hall are designed in the shape of a giant chariot borne on twelve carved stone wheels and drawn by seven stone horses. Today the worship of Surya as the supreme deity is limited to one small sect, but an image of Surya is in every Hindu temple. The ascended masters teach that God Surya is the hierarch of the God Star, Sirius. Sirius is the brightest star in the heavens and is the seat of God-government for this sector of the galaxy. Sirius (known to the outer world as the “Dog Star”) is known by astronomers to be a binary star of the constellation Canis Major. Sirius A, the brighter of the two stars, is a blue-white star that is twenty-three times as bright as our sun. Sirius B is a white dwarf star that is not visible to the naked eye. In the revolving of the lesser sun around the greater, we see the devotion of chela Cuzco to the guru Surya. When we speak of the God Star, we speak of a plane of consciousness where life has accelerated to etheric perfection and to the octaves of light beyond the highest frequencies yet within the range of what is called Matter. The planes of heaven beyond the planes of time and space are exalted in the God Star through the God consciousness of the vast being known as Surya. Surya, the Great Guru, and his chela, the ascended master Cuzco, are the ensouling divinities of these two points of light that move as one—as Alpha and Omega in a positive/negative polarity. 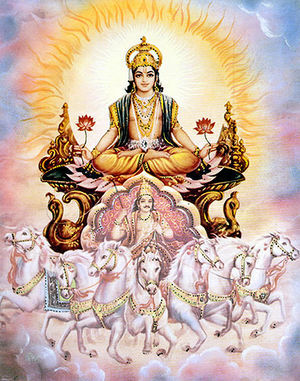 From the God Star, Surya holds the balance for natural forces in the earth. He is assisted by the ascended master Cuzco, whose etheric retreat is at Viti Levu in the Fiji Islands in the South Pacific. This retreat comes under the hierarchy of Sirius. Cuzco journeys back and forth between the earth and Sirius to make his report before the twenty-four elders and the Sun God and Goddess of the God Star. Surya is very much involved with the Lord Jesus Christ in the judgment of the fallen angels. He has promised to place his Electronic Presence wherever you are and wherever the fallen angels are on the entire face of the earth. You can visualize this mighty being Surya anywhere and everywhere on the face of the earth, seated in the lotus posture as a mighty Buddha of light. For problems that seem impossible to solve, give a novena to Surya using his decree. The response will be a very deep penetration of your being and world. Although the results may take time to manifest, the liberation is powerful and yet sometimes almost imperceptible, because it occurs at such deep levels of being. I affirm the origin of the sons and daughters of God at the point of the God Star, Sirius. I affirm this focus of the Great Central Sun as a point of origin for many who pass through earth’s schoolroom at this hour. Thus I come to reinforce the Order of the Blue Rose of Sirius, and I come to remind all of your fealty to the Order of the First Ray. And thus, I desire to enable you to understand how the beloved El Morya, Son of Sirius, devotee of the will of God, is the lord of the first ray for a reason—that reason being, beloved, that he does tarry in the earth for the training in the path of chelaship of those who are descended from that God Star and need the sharpening of the mind, the soul, the heart and the desire body according to a path of devotion and service, according to a true activity of the Gemini mind of God that is truly founded in that will, that holy will, which is the grid of light of the divine plan. If you can visualize the complex geometric form of earth itself, of a sphere, then understand that it is your congruency with that spherical pattern that does raise you to the vibration of Sirius, that does become the open door to the purity of Sirius and the open door to the return to that home of light. ↑ Surya, “Turning Points in the Earth,” Pearls of Wisdom, vol. 37, no. 36, September 4, 1994. ↑ Elizabeth Clare Prophet, The Opening of the Seventh Seal: Sanat Kumara on the Path of the Ruby Ray, p. 232. ↑ 10.13 in Prayers, Meditations and Dynamic Decrees for Personal and World Transformation. ↑ Astrea and Purity, Pearls of Wisdom, vol. 32, no. 18, April 30, 1989. ↑ Surya, Pearls of Wisdom, vol. 32, no. 19, May 7, 1989.